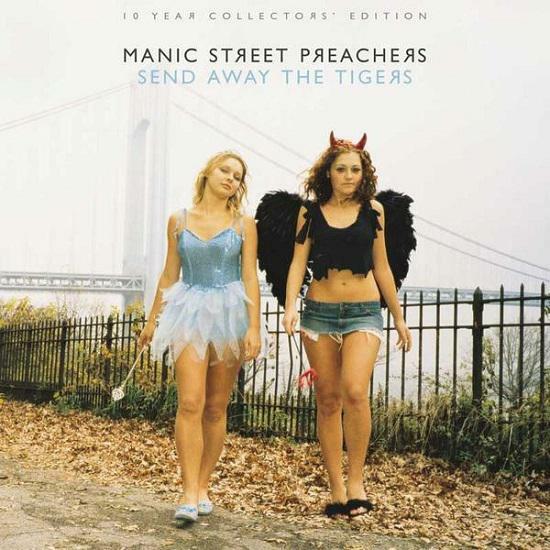 Manic Street Preachers have announced that their 2007 album Send Away The Tigers will be reissued to celebrate its 10th Anniversary on 7 May. The album will be re-released on CD and LP, with a limited number of signed copies available for preorder now. . The CD edition features a remastered edition album as well as b-sides and rarities spread over two discs, plus a DVD which features the band's 2007 Glastonbury performance, rehearsal footage, an album track-by-track, and promo videos. The double gatefold album release features the remastered album alongside the band's home demos of the era. The record has gone down as a significant comeback for the band at the time, coming after a hiatus and period of uncertainty as to their future. The release was buoyed by the huge success of number 2 single 'Your Love Alone Is Not Enough', a duet with Nina Persson of The Cardigans. Speaking of the reissue the band said: "Send Away The Tigers was a very important record for us, it gave us a new lease of life and helped us to rediscover our love of the band. This edition helps to tell the whole story. Through demos, home recordings and hand-written lyrics you find intimate details of a band about to reinvent themselves."